Just want to see it all? Go here. Brrr! I hope everyone’s snuggled up tight in their warm houses today. We’re having quite the nasty weather in Boston. Makes me want to knit! Gorgious yarn as per always!!! Today in the NC mountains we had temperatures in the teens and winds up to 50mph driving snow. I’ve been dying to knit all day! PRETTY! I am going to have to hunt the hubbys credit card… (squints) I must have! What fantastic colors! I am not in the need for yarn, since I dye my own, but I love those color combinations; that brown has a funky calming effect on the vibrant turquoise and fuchsia. Thanks also for the roaster update. You saved me a wasted purchase. Beauty-full yarn. Can you update us on the Insect Sweater? 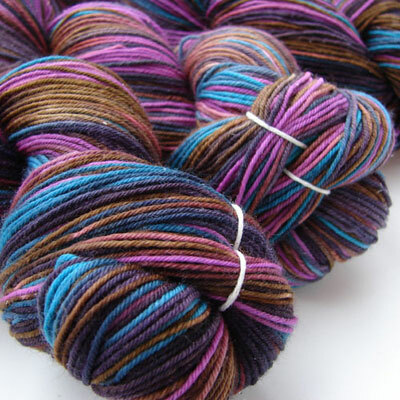 What is that colourway and why don’t I see it in your shop?? ?